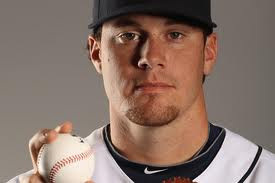 Blake Beavan, making his Major League debut for the Seattle Mariners today made GM Jack Zduriencik look really good. Beavan was acquired last year in the Cliff Lee deal that brought Justin Smoak, Josh Lueke and eventually Aaron Laffey to the M's. For a MLB debut, you couldn't ask for any more than what Beavan gave. The offense gave Beavan 3 runs, which is more than most of our starters have received, while Beavan gave up just three hits and one run through his seven complete innings. The M's got on the board early with a run in the first. Ichiro led off the inning with a single and after a stolen base, scored on an Adam Kennedy single. The Padres tied the game in the top of the third but it was short lived as the M's bounced right back with two runs of their own in the bottom half of the inning. The struggles still remain for the offense as the Mariners started the third by loading the bases and had no outs. We finished the inning with two runs on sac fly's by Smoak and Ackley. It's better than how we did yesterday as they were productive outs, but one day we're going to see a real rally in those situations and blow a game wide open. I'm ready for that. When Beavan came out after seven innings, he was all smiles. It must be a thrill to be there in the dugout after pitching such a great game in a "dream come true" moment of his life. Pauley pitched the 8th inning and made things really interesting as he loaded the bases to face Cameron Maybin. Luckily he got Maybin to strikeout on three straight pitches to end the inning. On a beautiful day in Seattle the M's pulled another "W" out of their hat and gave the first victory of what looks to be a solid career to Blake Beavan. Jack Z, not a bad job for trading away something that was never ours to begin with. Another series win, it's been a good month so far. Hopefully we get good results from the other two AL West games tonight. Feel free to comment!